The respiratory system refers to the organs used in breathing such as the nose, throat, larynx, trachea, bronchi, and lungs. Your body uses this system to take in oxygen from the air and expel carbon dioxide. Respiration - is the act of inhaling and exhaling. In others words, breathing. The term pulmonary is used to refer to processes or conditions involving the lungs. For example, pulmonary edema is an abnormal buildup of fluid in the lungs. Exposure to certain chemicals can result in irritation or damage to the respiratory system. Always read the MSDS to determine the safe working limits (PEL and TWA values) and to see what kind of personal protective equipment (PPE) is suggested. Avoid exposure to dusts, fumes and vapors. Respirators are pieces of Personal Protective Equipment (PPE) that can help protect your respiratory system from exposure to hazardous chemicals. MSDS's may call for such PPE if appropriate engineering controls such as fume hoods are not available. A drawing of the respiratory system at Kimball's Biology Pages. 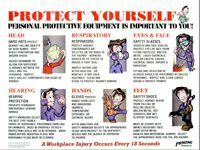 OSHA's Respiratory Protection Advisor Home Page with all kinds of links, training, tips, information and more. OSHA Publication 3079 - Respiratory Protection, a generic, non-exhaustive overview (280 Kb PDF file). 29 CFR 1910.134, OSHA's Respiratory Protection Standard. See also: asthma, emphysema, respirator.